With the rainy season upon us, I decided to make a June Essentials collage which contains an overview of what I think will be most helpful and appropriate for the weather and for the working girl who refuses to leave her style at home. I don't have everything on this list, but I would like to invest on these pieces. These are mostly based on what I've heard about the trend for June and what I personally will be needing as work wear. It might not be as cold as December, but it sure helps to have a cover-up or pullover within reach when the breeze gets cooler! Also, this will help you avoid getting sick when you go in and out of cold rooms. This, I had to deal with when I was in college... and even now that I'm working. Leggings and pants will be your friends this month as it might get too windy or cold to go around in frilly skirts. 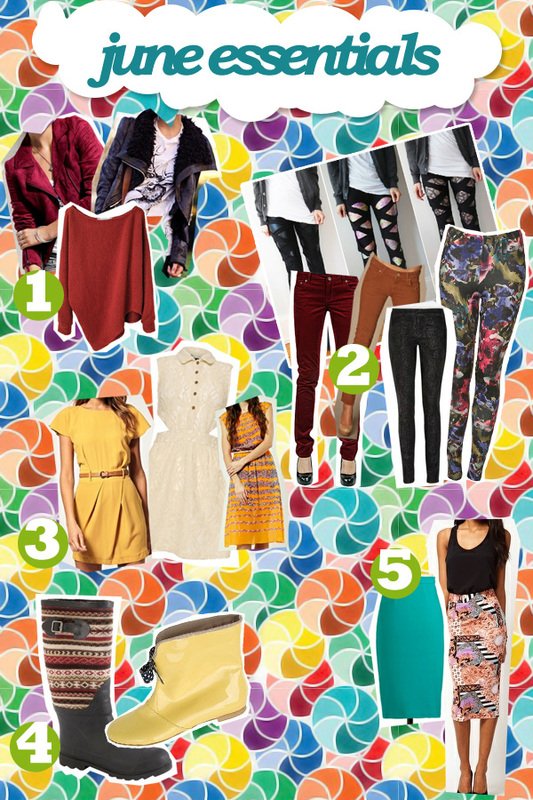 You can still have fun with them--try earth tones (browns, greens, maroons), ripped jeans/styled or even printed ones! Brave the rain and the challenge of Manila commuting in style! Working with separates? Still want to be able to mix-and-match? Then go for pencil skirts. Go for long ones or short ones. They don't need to be your usual boring black skirt! Again, get them in prints or colors. Now this one, I NEED. I was never really a fan of them, but as the rain has recently been showing up, I've been experiencing the difficulties of having to walk through wet pathways when commuting and soaking my non-waterproof footwear :( So after a quick Google search, I found that there are actually a couple of cute ones! Get the high cut ones or the low cut ones; get them in aztec print, plain colors, or even the ones with bows in front for the total cutesy effect! Anyone who would know where to get cute rain boots? This would be very helpful for commuters such as myself! And then once you get to your destination, change into your chic (and dry) statement shoes! That's it! These are just the top 5 things right off the bat. Weather-friendly and office-appropriate. Just always keep the dress code in mind, if there's any! If you have anything more you would like to add on to this list--perhaps, coming from a different angle? As a student?--feel free to leave a comment. Let's share what we know and help each other out! I'm off to Fort in a bit. So I'll talk to you lovely people again soon!